Here at Cornetts Supermarkets we take fresh seriously and that is why we guarantee it 200%. 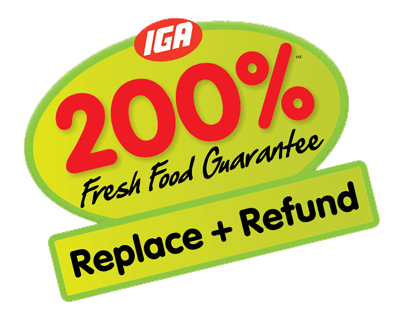 With the 200% Fresh Food Guarantee you can shop with confidence knowing that you will receive the freshest items available. If you are not happy with your fresh purchase we immediately replace the product for you and refund the value. So every time you see the 200% guarantee sticker feel confident in knowing that you are getting the freshest product available. It is our guarantee and we stand by it 200%.